I’ve suspended today’s TILT to bring up something serious and to fight back against the wrong being done to me. A few years ago, I had a cyber stalker. I have a few theories and ideas on who it was and who it wasn’t, but at the end of the year long period of hell, I was still none the wiser. This person impersonated me on Facebook and Myspace, hacked my email accounts, hacked my bank account (though because my bank is fairly secure there wasn’t much they could do), hacked into my built in webcam/microphone and generally made life hell for N and I. It all stopped as suddenly as it started, not long after N and I got married. It was scary and I was constantly worried that one day I would get a knock on my door and it would be whoever it was that was doing this to me. Today, I opened my email account to find a weird email from an address I didn’t recognize. The email was blank with a subject line that simply read “HI PRINCESS.” Immediately my blood froze and I was back in that mindset I was in four years ago–scared and victimized. Those blurry boxes towards the top center of the picture? Those are photos of me (I’ve blurred them as the blog is anonymous). Photos of me on someone else’s profile. Someone who I don’t know and someone who has just sent me a creepy, blank email. Needless to say, I freaked out. I called N and he had a look at all of the back-end technical bits to make sure it wasn’t a fake email address. It wasn’t… and the Facebook account is a real one. Naturally I’ve reported it to Facebook and am awaiting their response. When this happened to me years ago and I reported an account that was supposedly mine, it was removed within hours. I expect the same this time around. Even so, I’m angry. I’m not afraid anymore, I’m speaking out. Last time, I stayed silent. I didn’t seek help like I should have and I didn’t talk to people about it like I should have. This time, I’m spamming the world with this crap until I find out who the hell is doing this. And if it goes on longer than a week? Well, the UK just passed a cyber-harassment law and they will extradite offenders. Fine with me. I’m not going through this again. I think what bothers me the most is that it’s someone who knows me. I’ve changed my email since the last round of harassment. It’s someone who knows my new email. 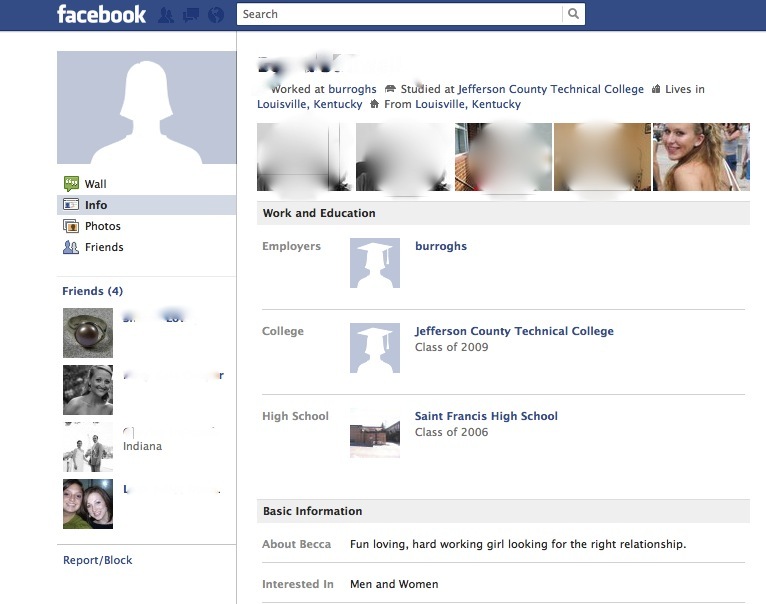 I’ve also made my Facebook photos and profile “friends only” so the photos were accessed by someone on my friends list. That’s what pisses me off… that someone who masquerades as my “friend” would think that this is funny or appropriate. I will find out who it is, whatever it takes. I won’t let it drop this time. I will not be a victim again, and whether the person who has done this is a friend or not, I will stop them, prosecute them if necessary. So while I haven’t done a TILT this week, I am still thankful. I’m thankful I’m strong. I’m thankful that I know, without a doubt, the few people who wouldn’t have done this. I’m thankful that I’m not taking this lying down anymore. I’m thankful that I am no longer afraid. i will go ghetto on them…they don’t want that to happen! You are a strong amazing woman (and I havent even met you!). Keep speaking out against this and put the fear of god in the person that is doing this to you!